During our last visit to Cape Town, I ordered a cherry gin cocktail in a beach bar. It was served with a sprig of rosemary and I loved the infusion of the cherry, gin and the aroma of the herbs. Their cherry mix was a little synthetic, but the result was generally quite pleasing. On our next trip to the supermarket, I naturally searched for cherry juice. I found the elusive juice eventually, but it was mixed with cranberry, so this is where the experimentation started. I decided to improve the taste of the shop bought cherry juice by blending frozen cherries in my Nutribullet. And, even if I have to say so myself, I created a cherry gin cocktail infinitely better than the one I had in the bar. Blend the frozen cherries and cranberry juice in your juicer. If you don’t have a juicer, you can use a food processor or blender, but you will need to strain the juice to remove any pieces of fruit which haven’t been liquidised. On its own, the blend of cherries and cranberry juice is quite dry. I like it like this, but if you prefer your cocktail a little sweeter, add a splash of gomme syrup. Start with a tablespoon and adjust as desired. You can buy gomme syrup, or you can easily make it yourself by adding sugar to boiling water and letting it cool. 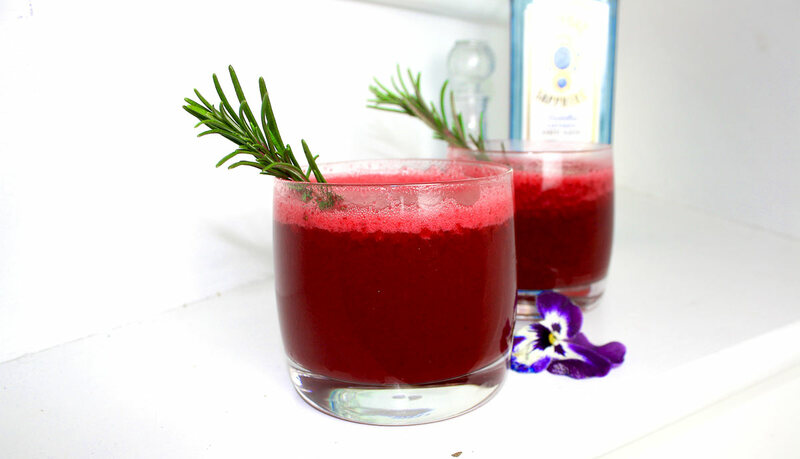 Add 50ml of gin to each glass, pour in the cherry and cranberry blend and then put a sprig of rosemary in each glass, using the rosemary to give it a stir. No ice is needed, the frozen cherries ensure that the drink is chilled enough to serve without ice. Who likes a watered down gin anyway! Great idea! I love gin! This is such a good cocktail, Guaranteed!